The principal artist at Austin&apos;s Fisterra Studio, Jennifer Chenoweth&apos;s most recent project, XYZ Atlas, uses community input to map the emotional experiences of Austin residents and visitors. Read on to learn about Chenoweth&apos;s monumental public-art project and her favorite hangouts in the city. XYZ Atlas Jennifer Chenoweth. Photo Credit: Michelle Atkinson. Your art has been shown in Austin, San Antonio, Kansas City, London, Miami, New York and Santa Fe - why did you decide to make Austin your home? Austin is the mecca for the weird, creative and fun, and people travel here as if on a pilgrimage to see what it is all about. I visited Austin for the first time after I met singer Stevie Ray Vaughan at a concert in Oklahoma City, where I grew up. He encouraged me to come find him at Antone&apos;s nightclub in Austin, which I did. I received my master of fine arts from The University of Texas at Austin in 1999 and decided to stay. I had moved a lot and was ready to settle down and build a life and studio. The art scene has really grown since then, and I&apos;ve always enjoyed music and dancing. Tell us about XYZ Atlas. Why is the project significant? XYZ Atlas grew out of a project that started as the Hedonic Map of Austin. I was thinking about how we form attachments to places through experiences; how we define our community by going to the same places for connection over and over again, like the farmers&apos; market or the Continental Club; and how to record our experiences. The project blends visual art, psychology and technology, including handmade and digital artworks and interactive events and installations - and all of it depends on participants&apos; stories. 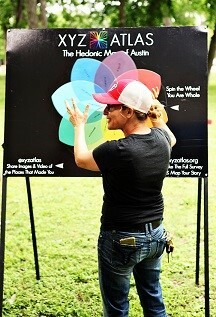 Where can visitors experience XYZ Atlas: The Hedonic Map of Austin? "The Dance of the Cosmos," a solar-powered, steel lotus flower that opens and closes, is on exhibit at the Elisabet Ney Museum in Hyde Park through spring 2016. The work is a 3-D diagram of emotional wholeness to show that we need all of our feelings and experiences, both positive and negative, to be whole. The 2-D artworks are also on display at the University of Texas at Austin&apos;s Department of Psychology. The City of Austin&apos;s TEMPO Public Art program includes the XYZ Atlas&apos; public sentiment campaign, where we include questions and quotes from the project on sculptural location markers in Austin City Parks. Keep an eye out for events as that project travels through the city through 2015. During the East Austin Studio Tour in November, we will have an installation and event at Fisterra Studio. In May 2016, the project will have its final exhibit and survey results at Austin&apos;s collective high point: the West Austin Studio Tour at Barton Springs and Zilker Park. Where is your favorite place to experience art in Austin? I enjoy the outdoors, and I like our public art collection, so my favorite place to experience art is outside on a bike. I especially like Erin Curtis&apos;s ceramic tile pieces on 3rd Street. I also enjoy the exhibit at the People&apos;s Gallery at City Hall and I love the Elisabet Ney Museum. What is your favorite place to eat in town? It has been amazing to live in east Austin for so long. They used to not deliver pizza east off I-35, and now I&apos;m walking distance to the best food. Favorites include Counter Cafe, Buenos Aires Cafe, Cenote, Hillside Farmacy, El Chilito and Launderette. Any other tips for first-time Austin visitors? Walk, bike and talk to people. Ask them what is the most fun they&apos;ve had here and what&apos;s going on this weekend. Everyone&apos;s an expert on hedonism here. What&apos;s in store for you for the rest of 2015 and 2016? What significant projects/exhibits should visitors keep an eye out for? For me, making art! I&apos;m learning how to turn my large-scale artworks into 3-D-printed pieces - and there are so many options in that evolving technology. I&apos;m honored to be working on the Drawing Lines project, where 10 different artists are creating projects for an Austin City Council District. The Contemporary&apos;s Strange Pilgrims exhibit looks exciting. I&apos;m a huge fan of artists Bruce Nauman and Nancy Holt. For those interested in participating in the XYZ Atlas project, take the online survey before December 31, 2015. Your Austin experiences will be included in the XYZ Atlas&apos;s GIS digital maps, sculptures and possibly an online and print catalog.